I had met Todd McFarlane briefly at the 1994 San Diego Comic Con. 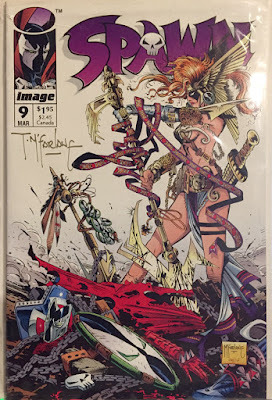 "Met" probably isn't really the most accurate word- he signed my copy of Spawn #9 (first appearance of Angela). At the time, I was more interested in meeting Greg Capullo, who was Todd's first penciller other than himself who worked on Spawn. I came across this interview of him on Youtube by Complex, and have realized a number of very strong points that are helping me bring my focus ever sharper. I am dropping my games for now- I need to focus on the sequentials, and I am going to concentrate on ONE property... and I know which one. Things have been rocky this month- my father-in-law has passed away and that's been rough. We are laying him to rest next week. Some other family items have come up, but life happens while you make other plans. The trick is to stay on course, and this video helped solidify my goals.